Our guest this episode is John Zimmerman, a pilot and a Vice President at Sporty’s, the world’s largest pilot shop. John talks to us about ADS-B, what it is, what you can do with it, options for implementing it, and how much it costs. We touch on the FAA strategy for getting aircraft operating in the U.S. airspace to ADS-B by 2020 – offering free weather as the carrot. Also, ADS-B in-only portable receivers, like the Stratus for the iPad, which gives you “portable avionics” – something useful for club airplanes, for example. John offers an explanation for why the iPad, and especially the Mini, is so dominant among tablets for aviators. We talk about Sporty’s Easy Approval solution for FAA approval to use your iPad with Foreflight Mobile as your Electronic Flight Bag. Also the factory assembled Vans RV-12 and the 2014 Sporty’s sweepstakes and Sporty’s Academy for flight training. Find Sporty’s on Twitter as @Sportys. We’ve often talked about the high cost of using airports in Australia, particularly the major hubs, and it seems the high cost of operating out of Melbourne’s Essendon Airport have forced a major user, business jet operator MyJet, to look for better options. Their solution comes in the form of relocating, thanks in part to some financial support from the Victorian government, to the regional city of Bendigo, 200km north west of Melbourne. During the week, they announced the opening of their new $A1.5million facility at the city’s airport, the largest such investment there in 40 years. They will now operate their small fleet of executive charter aircraft from this new base, using Essendon only as a pickup/drop off point. On the subject of investment, Qantas announced this week that they’ll be putting millions of extra dollars into their facilities in Perth, Western Australia, as part of their drive to remain competitive with Virgin Australia. The plans call for upgrades to terminals & lounges, news and improved catering options, additional flights each day and increasing the number of A330s operating on routes to and from Perth. The city is a major hub for people working in the mining & resources sector, and CEO Allan Joyce said this week that he sees no end in sight to the boom conditions that are creating the resulting demands on his airline. Airbus has also been in the news this week with a push to get the New Zealand government to consider the A400M & the C295 as possible replacement for their C130H fleet. 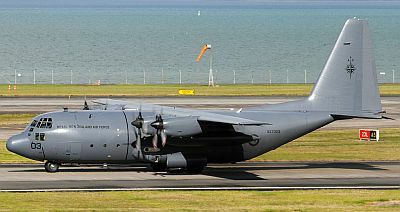 The RNZAF currently operates five C130H airframes, all of which have undergone life extension programmes in recent years, but Airbus executives are keen to see their military airlifters play a role in this region of the world. We wonder if they’ll try to convince the RAAF to consider the “Grizzly” as well. This week on Across The Pond we talk to Airplane Geeks fan and voice over artist Jesús Calderón. 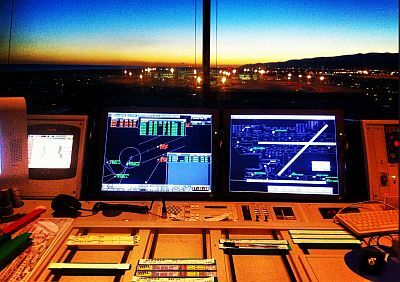 Jesús is an Air Traffic Controller in the Barcelona Tower and explains his passion about flying and also gives the team some feedback about the programme. Follow Jesús as @Hardenaw on Twitter and find him on Facebook. Lead post photo is Jesús Calderón’s office at night. This entry was posted in Episodes and tagged ADS-B, Airline Fees, AMOC, BA, certification, security, Sporty's, Vans on June 5, 2013 by maxflight. Just listening to guys complaining about United airways I would never fly with them I only fly Virgin when in the US won’t fly anything anyone else. It’s so good to hear your voice again in AvGeeks, Jesús!! And I asure Is the best host by far of BCN’s control TWR!